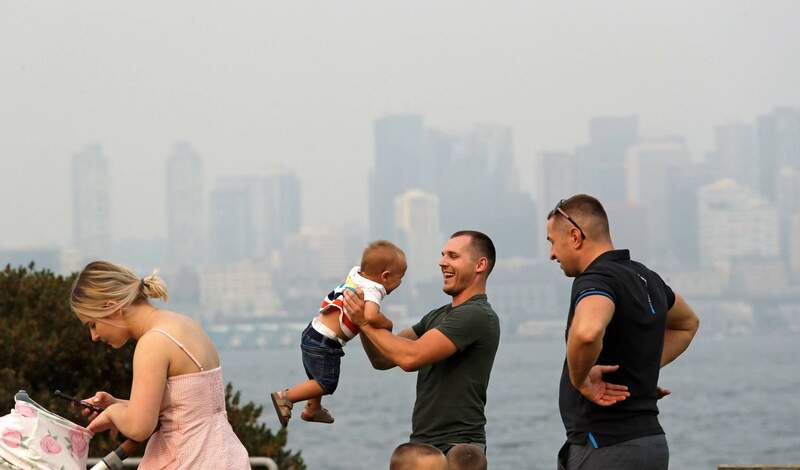 A man twirls a young child on a waterfront park as downtown Seattle disappears in a smoky haze behind Sunday. Poor air quality will be common across parts of the Pacific Northwest this week as winds push smoke from surrounding wildfires into the region, forecasters and regulators said. Air quality alerts are in effect for much of Washington state through Wednesday, according to the National Weather Service. The smoke is because of wildfires in British Columbia and the Cascade Mountains, according to the Puget Sound Clean Air Agency. SEATTLE – Smoke from wildfires clogged the sky across the U.S. West, blotting out mountains and city skylines from Oregon to Colorado, delaying flights and forcing authorities to tell even healthy adults in the Seattle area to stay indoors. Seattle’s Space Needle was swathed in haze, and it was impossible to see nearby mountains. Portland, Oregon, residents who were up early saw a blood-red sun shrouded in smoke and huffed their way through another day of polluted air. Portland Public Schools suspended all outdoor sports practices. Thick smoke in Denver blocked the view of some of Colorado’s famous mountains and prompted an air quality health advisory for the northeastern quarter of the state. The smoky pollution, even in Idaho and Colorado, came from wildfires in British Columbia and the Northwest’s Cascade Mountains, clouding a season that many spend outdoors. Simon said he won’t let the kids ride as far or take part in as many running games like tag while the air quality is bad. One of Colin Shor’s favorite things about working in the Denver area is the view of the high peaks to the west. But that was all but gone Monday. “Not being able to see the mountains is kind of disappointing, kind of sad,” he said. Forest fires are common, but typical Seattle-area weather pushes it out of the way quickly. The latest round of prolonged smoke happened as hot temperatures and high pressure collided, said Andrew Wineke, a spokesman for the state Ecology Department’s air quality program. It’s a rare occurrence that also happened last year, raising concerns for many locals that it may become normal during wildfire season. Wineke said climate change is expected to contribute to many more fires. The Federal Aviation Administration said airplanes bound for the Sea-Tac International Airport, Seattle’s main airport, may be delayed because of low visibility. In Spokane, air quality slipped into the “hazardous” range. Thick haze hung over Washington’s second-largest city, forcing vehicles to turn on their headlights during the morning commute. Patients at Denver’s National Jewish Health, a respiratory hospital, were reporting worsening symptoms, hospital spokesman Adam Dormuth said.